Many people think that stairlifts are all the same. Those people haven't seen the Starla, our most customisable stairlift. It's the perfect example of how a stairlift can be moulded to you. It comes in a range of upholsteries and with optional light or dark wood trim to fit seamlessly into your house. What do you get from your Starla? Whatever your tastes may be, you are sure to find what you’re looking for in a Starla. 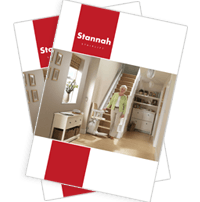 The most customisable stairlift from Stannah range. As well as giving you your freedom of movement back, it gives you comfort and safety in your home, while blending in with your décor. What defines the Starla is its refined elegance. We’re manufacturers, but we’re also designers. We wanted to make something that would look good in your home, and blend in with your furniture, seamlessly. That’s how we got to this design – a design you can mould to become your own. Whether you want a light or dark wooden trim, practical, wipe-clean vinyl upholstery or soft fabric, you can tailor the Starla to your needs. Your Starla will never let you down, not even in a power cut. Your Starla travel smoothly, quietly up or down your stairs at the push of a button. The footrest, armrests and seat of your stairlift flip down easily. Once it’s unfolded you’re ready to go. Optional features like the footrest fold button mean that unlike other appliances, there’s no bending or lifting involved at all. You even have the option of getting a Starla that turns on its own at the top or bottom of the stairs to let you off in complete safety. Our 40 years in stairlift manufacturing have taught us a thing or two about what you’re looking for in a stairlift. Take a look at the features we’ve added to the Starla to make it a stairlift you can count on. The Starla comes with 2 intuitive remote control call buttons. If your stairlift is on a different floor, press the button and it’ll come straight to you. It even lights up at night so you’re never stuck. Our especially designed ergonomic seatbelt can be done up with only one hand and fitted on either armrest of your chair. That means it’s easy to do up, even for arthritic fingers. The Starla has an angled seat that pitches you slightly back, making you feel safer on your journeys. The seat also registers pressure, so it won’t move until you’re seated securely. You can customise your Starla stairlift with a range of choices of upholstery - choose the colour, texture and even if you want a light or dark wood trim. It’s sure to match your home. We’ve seen a lot of staircases in our 150 years in business so we made the highly versatile Starla. It can be fitted whatever your stairs are like - straight, curved, spiral, long or short. The Starla comes with safety sensors, placed around the chair and carriage to detect obstacles that could be blocking the way. The chair comes to a quick but gentle stop if it detects anything.